10:45 Good afternoon everyone and welcome to AUTOSPORT Live for continuing coverage of round 15 of the 2010 FIA Formula 1 world championship. 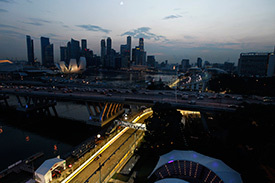 The sport has travelled to the far east, to the Marina Bay circuit for Singapore's third night race. Already, there is a lot to talk about following two interesting practice sessions. Sebastian Vettel blazed a trail to the fastest time in the second dry session and looked comfortable with both low and high fuel levels. Fernando Alonso pushed the German close and, on the evidence of yesterday, the Ferrari driver offers the greatest threat to Red Bull. Things aren't running so smoothly in the McLaren camp, with Lewis Hamilton labelling the modified Turn 10 'Singapore sling' as the worst corner he has ever driven. Others could throw a curved ball into the mix - particularly Rubens Barrichello, who put in a great performance in the second session last night. A late-night of set-up changes and modifications was completed in the small hours, but now the teams are ready to go as the stakes are raised around the city streets. 10:46 This evening, we will guide you through the final practice session with minute-by-minute commentary as the teams and drivers begin their build-up to qualifying. Later, at 13:45 GMT, we will return for live coverage of the all-important qualifying session and the battle for pole position. AUTOSPORT Live will end the day with a detailed Sunday weather forecast, on the Singapore Grand Prix weather page. 10:47 Afternoon showers meant tricky circuit conditions at the start of first practice on Friday. Some parts of the track were almost dry, but other sections had large puddles and standing water. Nevertheless, the drivers were able to complete their installation laps without incident. Michael Schumacher is one of the few drivers never to have driven at the Marina Bay circuit, so it was perhaps understandable that he was one of the first out onto the track for a run of laps. In the 30 degree heat, the circuit slowly dried out and Jaime Alguersuari was one of the first to try out slick tyres. The Spaniard's run gave the rest of the teams valuable information on the state of the track and how early you can use dry rubber. The last 20 minutes saw the timing monitor spin like a fruit machine as each lap went to the top of the order. Mark Webber was the last man over the line and so he took the spoils with late lap of 1m54.589s, ahead of Schumacher in second, Sutil third, Vettel fourth and Alguersuari in fifth. The track dried out completely during the break between sessions, and the early stages of the night session gave the drivers the opportunity to push a little harder. There were several minor incidents with drivers overshooting braking zones and rejoining the track. 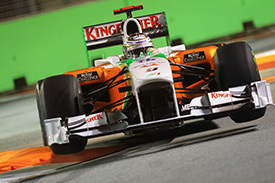 Adrian Sutil found trouble at the Turn 10 'Singapore sling' and clattered the kerb heavily, breaking the left front suspension of his Force India. Alonso also had problems further along the road at Turn 18. 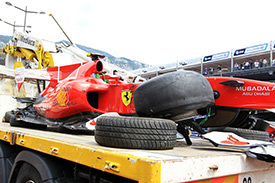 The Ferrari driver reversed back on to the circuit and then promptly stalled the engine, ending his session. At the time, he was putting in a great lap that was set to challenge pace-setter Vettel. Up front, the Red Bulls put on a daunting display of dominance. Despite the heat, Vettel sent a chill down the rest of the pitlane with a fantastic 1m46.660s lap midway through the session. Team-mate Webber was the only driver within one second of him, with Button third, Alonso fourth, Hamilton fifth and Rubens Barrichello in a fine sixth position. 10:49 Like yesterday, afternoon showers fell over Marina Bay - mainly light and persistent rain between 12:30 and 15:00 - so we start today's action with a damp circuit. The track is continuing to dry out all the time and should be good for dry tyres very early into the session. No further rain is expected this evening, with Singapore currently clear of any showers on the radar. It's another hot one in the city-state, with temperatures around 31 Celsius, dropping slightly towards 29 Celsius by the end of qualifying. 10:50 Keep up to speed with our minute-by-minute commentary on the move with the new AUTOSPORT app. • Fernando Alonso stalled his Ferrari F10 at Turn 18 after reversing back onto the circuit. When he selected first gear, an experimental component on the gearbox broke, causing him to miss the last 20 minutes of the session. • Michael Schumacher was positive after his first experience of driving at night in the two practice sessions at Marina Bay. "It has been a lot of fun driving this track today, even in the dark. It is the first time driving here in Singapore for me and I was curious to experience how it would be and I have to say that I liked it," said the German after the first day. • Rubens Barrichello spent much of Friday's running trying out a new rear diffuser solution. The Brazilian was very happy after his run to sixth place, while team-mate Hulkenberg admitted he was enjoying Singapore and looking forward to a strong weekend. • Adrian Sutil's night session was ruined when he clattered the kerb at Turn 10. The German toured round on three wheels with a broken Force India, but eventually pulled off the track. Later, the stewards deemed that Sutil had failed to stop in an unsafe car and handed out a $10,000 fine. 10:53 The teams no longer have a fully assembled spare car available for instant dispatch on to the circuit as they would have a few years ago, piling the pressure on the drivers not to make any mistakes in this session on a circuit with extremely close walls and barriers. Any crash will have to be repaired before the start of qualifying, just two hours after the end of practice, or the driver will find himself at the back of the 24 car field - a heavy price to pay for failing to take part in the knockout session and something that could cause terminal damage to a title contender's campaign. Even worse, if the chassis is damaged beyond repair in practice or qualifying, the driver will be forced to start the race from the pitlane in a car built around a new tub - something Fernando Alonso found out to his cost in Monaco earlier this year. This is also the time when another rule may begin to bite: the eight engine restriction. With race motors now fitted to the cars, some teams may begin to limit running in this session to avoid running out of poweplants for the rest of the year. Ferrari, in particular, has a relative lack of fresh motors after a spate of early-season failures. 10:55 There are just five minutes to go until the third and final practice session begins at Marina Bay. 10:56 The track has largely dried out from rain earlier in the afternoon, but there are still some damp patches, mainly off the racing line. 10:58 Jaime Alguersuari is advised on the team radio that the circuit is still damp in places, but that he will start the session on slick tyres. 10:58 Timo Glock is prepared for action in his Virgin car, ready for an installation lap. 10:59 A large crowd is gathered at Marina Bay in anticipation of a great night's action on the track. 0 min: Petrov leads the pack out with intermediates on his Renault, while many drivers have opted for slicks. 2 min: Rubens Barrichello leaves the Williams garage as he heads out for an early lap in the Williams. 2 min: Many of the leading contenders are installing on wet rubber to save life in the limited sets of slicks allocated to this session. 3 min: The Toro Rosso drivers return to the pits on their slick tyres. Both cars are wheeled back into the garage by the mechanics. 4 min: Sebastian Vettel heads out for a lap on intermediate tyres. The German was stunningly fast yesterday in second practice. 4 min: Christian Klien is on the circuit and about to complete the first timed lap of the session. 5 min: Michael Schumacher is also on the circuit, as Klien comes back into the pits, rather than complete the lap. 5 min: Kovalainen is the last man to emerge for an installation tour in his Lotus. 6 min: Schumacher returns to the pits and lays some rubber down in the pit box. He completed that installation lap on intermediate tyres. 7 min: Vettel returns to the pits following his checking lap. 7 min: Vettel is wheeled back into the garage and the mechanics perform all the routine checks to ensure that the car is okay. 10 min: There are no cars on track as the machines continue to be checked over in the garages. 10 min: Nico Hulkenberg has walked across to the Williams pit gantry for a brief chat with the engineers. He wanders back towards his car. 12 min: Mark Webber is chatting with Red Bull team boss Christian Horner, as the rest of the field waits for track conditions to dry out a little more. 13 min: The damp patches still on the circuit seem to be adding to the pause as everyone waits for someone else to go out first. 14 min: Kobayashi breaks the silence and heads out in his Sauber. 15 min: Di Grassi joins him for some early running in the Virgin car. 16 min: Kobayashi pits after a single tour and heads back towards the Sauber garage. 17 min: Di Grassi remains on track and is the first man to start a lap against the clock. 18 min: Sections of the circuit remain damp, as many of the drivers wait for a better time to go out and put laps on the board. 18 min: Jaime Alguersuari joins the racetrack in the Toro Rosso. 19 min: The kerbs are clearly still slippery and care will be needed for these first few laps on the circuit. 20 min: Di Grassi clocks a 2m00.831s to get proceedings underway. 20 min: Alguersuari crosses the line and begins his first timed lap of the session. His team-mate Buemi is also on the circuit. 21 min: Alguersuari negotiates the Singapore sling and continues on towards the final sector of the lap. 21 min: Petrov and Kubica are now on track for runs in the pair of Renaults. 21 min: Alguersuari is several seconds ahead of di Grassi, as he rounds the final corners of the lap. 22 min: Alguersuari posts 1m54.047s to take the quickest time away from the Virgin driver. 22 min: Christian Klien, Nico Hulkenberg and Bruno Senna are all on the circuit. Tonio Liuzzi joins them. 22 min: Petrov joins the order in second quickest with a lap of 1m55.649s. 23 min: Massa is now out for his first run with hard tyres on his Ferrari. 23 min: Alguersuari is set to improve over his opening mark on this second timed lap, as we see him bouncing wildly over the kerbs at the Singapore sling. 23 min: Alguersuari improves to a 1m52.703s as his team-mate Buemi comes up to second place. 24 min: Heidfeld slots in third quickest in his Sauber with a time of 1m54.502s. 24 min: Robert Kubica tops the times for Renault with his first effort of 1m52.248s. 24 min: Nico Rosberg and Michael Schumacher join an increasing number of drivers on the circuit. Schumacher stated yesterday that he is enjoying his experience of night driving. 25 min: Adrian Sutil is also on track for Force India. 25 min: Alguersuari retakes the top spot away from Kubica with a lap of 1m52.229s. 26 min: Buemi crosses the line a few seconds later, and takes the top position away from his team-mate with 1m52.122s. 26 min: Kubica tops the times again with a 1m50.958s. 26 min: Hulkenberg pops up into second position, behind Kubica, with a lap of 1m51.677s. 26 min: Alonso is now out in his Ferrari. Like team-mate Massa, both drivers are not running the F-duct, presumably for the rest of the weekend. 27 min: Michael Schumacher is on his first timed lap now, with Kubica leading the early runners, Hulkenberg second and Buemi third. 27 min: Hamilton is now out in his McLaren. 27 min: Schumacher is on slick tyres as he goes through the tunnel under the grandstand and on towards the final corners of the lap. 27 min: Schumacher manages 1m51.398s to go second fastest behind Kubica. 28 min: Kubica's strong first run continues as he improves to a 1m50.428s to extend his advantage at the top of the times. 28 min: Alguersuari has returned to the pits after that first short run of five laps. He is now fifth in the standings behind team-mate Buemi. 29 min: Adrian Sutil completes his first timed lap of the evening, and posts 1m55.215s to slot into an early 14th position. 29 min: Alonso finds a lack of grip at Turn 5, where the circuit is still quite damp. 29 min: Schumacher is improving on his second timed lap, and retakes that second position with a lap of 1m50.983s. 30 min: Hulkenberg rounds the final corner, but is unable to improve on fifth place. Kubica leads the field with Rosberg up to second with 1m50.525s. 30 min: So Kubica leads the standings ahead of Rosberg in second, Schumacher third, Buemi fourth and Massa in fifth place. 30 min: Massa is up to fifth quickest in his Ferrari, while Hamilton has slotted in 10th after his first effort. 31 min: Sutil completes another timed lap, but moves up only one position to 13th, with a time of 1m52.979s. 32 min: Replays showed Nico Hulkenberg attacking the opening complex of corners. He loses grip at the rear in Turn two, but is able to correct the oversteer. 32 min: Alonso slots in sixth quickest after a cautious first flying lap, with the Spaniard keen to avoid a repeat of yesterday's mistake. 33 min: A much better lap from Adrian Sutil this time. He improves to fourth position in the Force India. 34 min: Sebastian Vettel posts 1m51.128s and is now in ninth position, as we see Bruno Senna spin at the Singapore sling. 34 min: Senna spins 180 degrees at the tricky chicane, bringing out the yellow flags briefly. 34 min: Lewis Hamilton takes away the ever-changing top time with a 1m49.651s in his McLaren. 35 min: The drivers are clearly struggling with the dampness of the circuit. Webber is the next to lose grip as he takes to the escape road. 35 min: Webber is able to rejoin without any damage to his Red Bull. 36 min: Hulkenberg takes the top spot with a lap of 1m49.538s in the Williams. 36 min: Hamilton takes back the benchmark as he gets a feel for the improving track conditions. A 1m49.000s is now the time to beat. 37 min: Mark Webber has continued on this run and his latest lap is looking much better, as Barrichello goes 12th. 37 min: Webber crosses the line and moves up into second position behind Hamilton, with a lap of 1m49.315s. 38 min: Vettel is also on the circuit for Red Bull Racing. 38 min: Button improves in the shuffle of the leading contenders to go fifth, with Alonso now seventh and Massa eighth. 38 min: Alguersuari improves to 11th position with a lap of 1m50.576s. 39 min: Vettel is up to fourth, as Red Bull looks to take over at the front of the field. 39 min: Webber crosses the line ... but remains second to Hamilton after posting an improvement of 1m49.315s. 40 min: Alonso improves to fourth quickest with a 1m49.609s. 40 min: Hulkenberg is now a sensational third in the Williams with a lap of 1m49.304s. Alonso is fourth, with his team-mate Massa fifth. 41 min: Massa is also up to fifth in his Ferrari as the leading runners complete their hard tyre runs. 41 min: Alonso now tops the times, beating Hamilton by just under a tenth in 1m48.909s. 41 min: Vettel blasts his way to the top of the times, with a rapid 1m48.730s lap as the improvements come thick and fast. 42 min: So the order is all changed up front. Vettel is the current pace-setter with Alonso second, Hamilton third, Webber fourth and Hulkenberg fifth, with 18 minutes to go. 43 min: Many of the leading drivers have headed back to the pits for the inevitable change to soft tyres and the qualifying simulation runs. 44 min: Behind the top five, Massa is sixth with Kubica seventh, Sutil eighth, Barrichello ninth and Button in 10th. 44 min: Kubica and Alonso survive a very tight moment as the Renault just edged by the Ferrari emerging from the pits. 45 min: Mercedes drivers Schumacher and Rosberg are both on the circuit. They are 12th and 13th in the classification, with laps 1.5 seconds slower than Vettel. 46 min: Vettel improves again and extends his advantage at the front of the field. 1m48.350s lap puts him 0.559 seconds clear of Alonso. 47 min: While Vettel was improving his pace, Rosberg explored the limits at Turn 5. He was able to rejoin without damage. 47 min: The top eight drivers are all in the pits, with Buemi now ninth after posting a recent improvement of 1m49.949. 48 min: Michael Schumacher runs off the road at the opening chicane. He straight-lines the left-right-left complex and continues. 48 min: Buemi comes back into the pits, meaning that the top 12 runners are all garaged currently. 49 min: Hamilton is busy studying data from his earlier efforts ahead of the final run on soft tyres. 49 min: Rosberg improves the 10th position with a lap of 1m49.961s in the Mercedes with just over 10 minutes remaining in the session. 50 min: The HRT drivers are almost two seconds slower than their nearest rival - Jarno Trulli in the Lotus. Klien is 23rd, leaving Senna in 24th. 51 min: Rosberg improves again to 1m49.166s. That is 0.816 seconds shy of Vettel's benchmark. 51 min: Senna is out on the circuit using the option tyre. You would expect that he should be able to improve on a 1m56.147s, or it's going to be a very long race for the Brazilian. 52 min: Hamilton and Kubica are now out for a run on the super-soft rubber as the pre-qualifying scramble gets underway. 52 min: We're starting to see some of the leading drivers come out onto the circuit with just under eight minutes to go. Vettel leaves the pits, as does Hulkenberg. 53 min: Webber is also on track and Sutil joins him. Rubens Barrichello also comes out for a final run. 54 min: Hamilton is on to his soft tyre flyer, with clear track in front of the McLaren but he has backed off on this effort after an early mistake. 54 min: Senna improves by 0.7 seconds with a lap of 1m55.367s. His team-mate Klien also finds the same margin to move closer to Trulli's Lotus. 55 min: Heavy traffic is building now with 20 cars on the circuit with soft tyres. 55 min: Only four drivers are left in the pits with just under five minutes to go. 56 min: Schumacher and Rosberg come out for their final run, as the rest of the pack circulates a high-speed in an attempt to find one lap pace. 56 min: The tricky damp patches are still catching out the drivers and so far there is little improvement with the softer tyres. 56 min: The best times remain those set with well-warmed sets of the harder tyre. 57 min: Hulkenberg posts the fastest first sector time at 30.4 seconds - that is two-tenths quicker than Vettel's current lap. 57 min: Hulkenberg encounters traffic and is forced to back off, as Barrichello also posts a 30.4 seconds first section time. 58 min: Vettel is now running very quickly and has a clear lap. He rounds the last corner and improves again! 58 min: Vettel posts 1m48.028s to extend the advantage at the front of the field. 59 min: Alonso improves with his latest effort on super-softs, but he is still over six tenths off Vettel's best. 59 min: Mark Webber is flying with a fastest first sector time, but this lap could be ruined because Bruno Senna is stranded on the circuit. 59 min: Massa grabs a late fourth, while Hamilton has not improved and remains third with his hard-tyre time. 60 min: Senna has overshot at Turn 18 and is beckoning the marshals to come and push him back onto the circuit. 60 min: The flag is now out to wrap up practice in Singapore. 12:00 Senna has been forced to kill the engine and therefore hasn't been able to get a final fast lap. 12:00 Hamilton sets the fastest first sector but he will be unable to complete the lap quickly with Senna off at Turn 18. 12:01 Senna climbs out of the car as Vettel posts a sensational 30.1 seconds first sector. 12:02 Vettel comes back into the pits, but he ends the session as the fastest around Marina Bay as Red Bull continues to dominate. 12:03 Alonso finished second, 0.622 seconds down on the German, with Hamilton third and Massa fourth. 12:03 Rosberg was fifth the Mercedes, just over one second adrift. Webber was sixth in the second Red Bull, with Hulkenberg seventh. 12:04 Kubica ends his session in eighth, ahead of Sutil ninth and Sebastien Buemi rounds out the top 10. 12:05 Timo Glock is the quickest of the new team drivers in 19th position. Kovalainen was 20th, 0.8 seconds down on the Virgin driver. 12:06 Jenson Button finished a lowly 13th in the classification, more than two seconds slower than Vettel's 1m48.028s. 12:07 Weather conditions are still the same over Marina Bay. The radar remains clear of showers and we expect to see a dry qualifying session later on. 12:08 Evidence from the final session indicates that the soft tyre compound will take two or three consecutive laps to give the best performance. 12:14 So Red Bull again leads the field in practice at Singapore. But as we suspected yesterday, Alonso will be there to challenge Vettel and Webber, while Hamilton looked happier with his McLaren today. Heidfeld, Liuzzi and Kobayashi are set to battle to escape the drop in Q1, but up front the likelihood is that the index finger of celebration will be raised again. 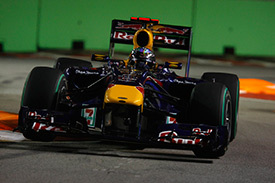 Will Vettel take pole and give himself a great platform for tomorrow's Singapore Grand Prix? Join us at 13:45 GMT for the qualifying battle.